Ciabatta is a simple type of Italian white bread, made of wheat flour and yeast. 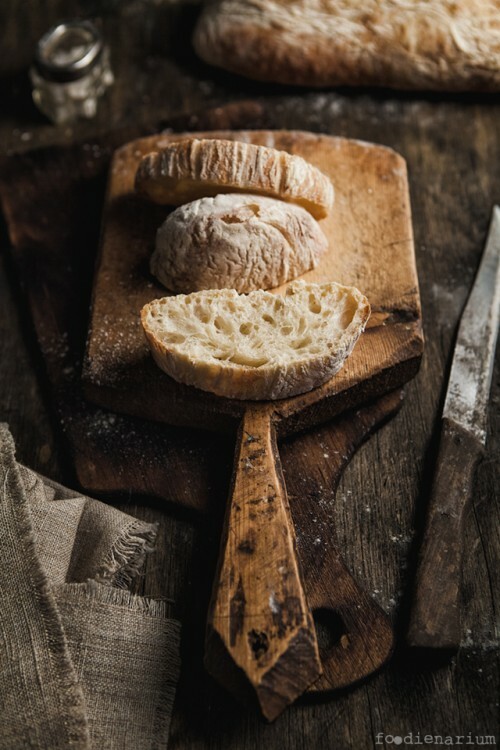 It was developed in 1982 and in the late 1990s it became popular in Europe and the U.S.A. A feature of this bread is a crispy crust and the flesh with large, irregularly distributed porosity. Ciabatta is often used as sandwich bread. In Italian cuisine it’s even added to such dishes as salad, soup, etc. There are many varieties of this wonderful bread, and many ways of baking it. I’ll tell you about a rather simple method that takes a little time. But it requires a good stationary mixer like KitchenAid. p.s. The recipe is adapted from thefreshloaf. There is also an awesome video on youtube that shows how things should be done. Mix all ingredients in a mixer with the paddle and let the dough rest for 10 minutes. Knead the dough with the same paddle at high speed. It will take about 8-10 minutes. Somewhere in the middle of the process I change the paddle to the dough hook. To the end of the process the dough starts to leave off the walls, they will become kind of cleaner. When this starts to happen, closely watch the process. Next, the dough will begin to properly ‘climb’ the hook. Catch the moment before it will climb above the hook and turn off the mixer. Move the dough into a bowl well-greased with oil and close with the cling film. Let the dough rise in a warm place. It will take about 2.5 hours. The dough must triple in size! Then throw out the dough onto a work surface really well-covered with flour. Divide the dough into 2 pieces and shape the ciabattas. Poke them a little with your fingers. Sprinkle them generously with flour, cover with dough with a plastic bag and leave it for 45 minutes. At this time, warm the oven with a baking stone to 230C (500F). Also put a pan for water on the bottom. By the way, I use a usual stair tiles instead of the stone and that works well for me. Next, you need to turn the ciabattas and put them into the oven. I put the baking paper on the plank, sprinkle it with flour and lay ciabattas on it. Then I tap paper with ciabattas on the rocks from this plank right onto the stone. Also pour a cup of boiling water into the pan at the bottom of the oven, cover it, and bake the ciabattas for 15-20 minutes. When the ciabattas are ready, put them on the wire rack and let them cool.